You are currently browsing the tag archive for the ‘Flamengo’ tag. Flamengo, less real fans than Hibs? The report claims that 16.8 % of those polled back the Rio side, while 14.6 % support Corinthians. The next best placed team is Sao Paulo, with 8.1 % of preferences. The study, carried out by Stochos and Pluri, is the latest in a string of such reports rating the support of Brazilian clubs. It feeds into the myth that teams like Flamengo and Corinthians have 30 million fans. Using even that loose destination, it’s clear that Flamengo or Corinthians have nothing like the 30 million fans they are purported to have. Some 4,000 people turned up to see Flamengo last weekend. That’s 4,000 people in a city of around 8 million. Or 1-in-2000 people. Compare that to Dortmund, the best supported club in Europe. Their average crowd is 78,000 in a city of 600,000 people. That means 1-in-6 locals go cheer their team. In other words they have 333 times more fans than Flamengo. It’s a similar story elsewhere. The mighty Hibernian sit sixth in the Scottish Premier. Average crowds are around 9,000. Edinburgh has a population of 450,000. So 1-in-50 people in Edinburgh alone go see the Hibees. As I wrote here last year, more people go see top flight matches in China, Mexico and Japan than in Brazil. Studies like this one should be treated with a massive pinch of salt. The real news here? That in the ‘pais de futebol‘ more than 1 in 5 people don’t even like the game. When I first came to Brazil I was shocked at how many people wore football shirts. Everybody wore them, young and old, male and female, and they wore them everywhere. It wasn’t unusual to see people in nightclubs or restaurants wearing the colours of Flamengo, Corinthians, Palmeiras and dozens of others. I thought it was weird (and still do). If one thing has changed over the last decade it is that you no longer see people wearing just local shirts. Nowadays, for every Botafogo shirt there’s a Chelsea one, for every Cruzeiro a Barcelona, and for every Gremio a Liverpool. Turned off by the corruption and mismanagement endemic in their domestic game and with the exotic attractions of Europe available on demand via TV, the internet and video games, many Brazilians – especially youngsters – are taking a greater interest in foreign football. Read the full Reuters story here on how Brazilian fans are paying more and more attention to European clubs. One is that Brazilian football is expensive and still a bit of a mess (even though it is slowly getting better). Another is that more Brazilians have more money to spend, as I’ve written about a thousand times. And third, the world is smaller and more people have more access to European football, via TV, the internet, social media and video games. Brazilian clubs are trying to internationalise. But the truth is their fans have already taken that step. Surprise, surprise. Adriano screws up again. Less than two weeks into his new stay at Flamengo, the man they used to call The Emperor missed training and failed to contact the club and say why. He was supposed to turn up at the club’s training ground this afternoon but was posted AWOL. Adriano was drummed out of several clubs in Europe and South America for breaches of discipline but that didn’t stop the Rio club signing him last month. That was not a major surprise because anything goes at Flamengo, one of the most disorganised and poorly run clubs in world football. Football fans like myself just sighed and shook our heads and asked, How long till he’s involved in one scandal or another? The answer was not very long. It would be comical if it wasn’t so tragic. The first time I covered the Brazilian seleção was at the Copa America in Paraguay in 1999. A skinny little teenager called Ronaldinho Gaucho scored his first goal in a yellow jersey and for days the Brazilian press were all over him. A week or so later, they’d lost interest and he was sitting all alone in the corner of a ballroom at the team hotel. I went over to him and tried to chat. I spoke no Portuguese at the time and he spoke no Spanish and we spent 30 seconds trying to converse. It was useless. I didn’t understand him and he didn’t understand me. We gave up. Well, now he speaks Spanish and I speak Portuguese and we’ve both come a long way. And on Tuesday night I finally got an interview with Ronaldinho at Atletico Mineiro’s training ground outside Belo Horizonte. You can see the whole story here at Reuters but it’s essentially a piece on how he’s put the Flamengo debacle behind him and is playing impressive football again with a team leading the league. A rejuvenated Ronaldinho has established unheralded Atletico Mineiro as favourites to win their first Brazilian league title in four decades with the scintillating form that marked his time at Barcelona. The charismatic forward has been resplendent in a campaign that has seen Atletico beaten just once in 19 games. With the season half over, his team is top of the table, a point ahead of Fluminense with a game in hand. Former Manchester City striker Jo is scoring goals, midfielder Bernard has staked a claim for the young player of the season, and Ronaldinho has shown glimpses of the form that won him FIFA World Player of the Year awards in 2004 and 2005. Ronaldinho has also had a crucial bit of luck. The goal he scored on Sunday against Cruzeiro was one of his best for ages (see below). It brought him headlines around the world for the first time in years (for the right reasons at least) but what few people seemed to notice was the part that luck played. The last Cruzeiro defender to tackle him actually gets his foot to the ball but rather than knock it out of touch, it hits off Ronaldinho’s shin and falls perfectly for him to slot home. That’s not taking anything away from him; it’s a great goal. But there are times in your life when these things go right and times when they don’t. Things are going right for Ronaldinho and Atletico now. Ronaldinho has without doubt been a waster in the past. And I wouldn’t be in the least surprised if there are other scandals involving parties and girls before the season is over. But I got the impression that he knows exactly what winning the championship with Atletico would mean. In its own way it is every bit as special, and probably much harder, than winning the Champions League with Barcelona. It’s been nine years since a team outside Rio or Sao Paulo won the Brazilian league. I can’t think of a more deserving team than Galo to break that streak. I started writing a story this morning about Ronaldinho Gaucho’s departure from Flamengo that ended up here on Reuters. The question for Ronaldinho is where he goes now. Most doors looks closed to him in his homeland because few clubs can afford his salary demands and fans see him more as a disruptive influence than creative one. One poll asked fans of Brazil’s top flight clubs if they’d welcome Ronaldinho in their side. Supporters at all 20 teams said No. Gremio and Palmeiras, the two other clubs who tried to sign him from Milan, have rejected any suggestions they might want to sign him. Both teams are still angry at the way he misled them in contract talks last year – Ronaldinho allegedly promised to sign for both clubs before jilting them for Flamengo – and neither could afford him or put up with the associated problems he brings. Perhaps the most likely destination is one of football’s emerging markets; the Middle East, the former Soviet republics, China or even the United States. In many of those countries, teams pay top dollar and give their top players more freedom. How wrong I was. Ronaldinho signed for Atletico Mineiro today. They must be mad. Even though they are getting him on the cheap, he’s unlikely to reproduce anything like the form that made him the world’s best player two years running. Ronaldinho will turn it on in flashes for Atletico. But unless he’s learnt his lesson at Flamengo and starts becoming a lot more professional then he’ll be out of Belo Horizonte by Christmas. There are a few great statistics knocking around that illustrate just how the strong real is enabling Brazilian footballers return from Europe and how that football is becoming better managed. 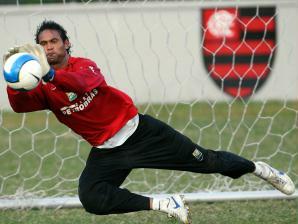 For example: In 2005, 804 Brazilian footballers left the country to sign for foreign clubs. In 2008 that number had risen to 1,176. It started to fall the year after and has been falling ever since. At the same time, the number of athletes coming home has risen every year since 2006, when 311 returned. Here’s another: Corinthians are seriously offering around 40 million pounds to sign Carlos Tevez from Manchester City, one of the richest clubs in the world. Just three or four years ago it would have been unthinkable that a Brazilian club could afford to sign a player at the height of his career like Tevez. Of course, this could not happen with any top star. It is only possible because Tevez supposedly wants to be in South America, where he is closer to his family and where standards of professionalism are not as high as in Europe. But it would be fantasy if Tevez wasn’t able to earn almost as much in Brazil as in England or Spain or Italy, thanks to the strength of the Brazilian real, which earlier this month reached its highest level against the dollar since 1999. It is also because at long last serious administrators are replacing the corrupt dinosaurs who ran Brazilian league clubs as I point out in today’s Financial Times. The new generation have put into place season ticket schemes that guarantee them income, struck new deals that in some cases have tripled their annual revenue from television, and signed significantly bigger sponsorship deals with companies that bank new signings. Sponsors, for example, pay 75 % of what Ronaldinho Gaucho earns at Flamengo and 800,000 reais of Neymar’s 1 million-real-a-month deal with Santos. Having said that, clubs like Santos and Flamengo are still a long way from earning the kind of money made by Manchester United or Barcelona. The moment is also dependent on the continuing strength of the real, which many economists believe is overvalued (see this excellent Bloomberg piece). If it weakens, clubs will once again find it harder to match their European rivals. Nevertheless, the structural changes taking place today are similar to the revolution in English football in the 1990s after Sky TV injected hundreds of millions into the game and stadiums were modernised following the Taylor report. There is still a long way to go. But they are heading in the right direction. Some of the first football matches I ever went to in Brazil involved Fluminense, the team supported by my first friends in Rio. We went to the Maracana (where else? 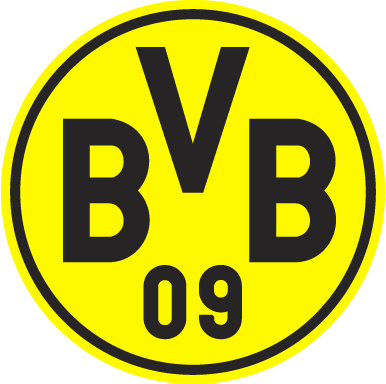 ), to watch them play, mostly in local derbies. The message “Silence in the favelas” was a clear wind up to the Flamengo fans. The team is the most popular in Brazil and many of its fans are drawn from Rio’s and Brazil’s lower classes. Bruno, like many Flamengo players, grew up poor and was suddenly catapulted to fame and fortune. He probably earned more in a month than his family – who abandoned him as a child – earned in their entire lifetime. Flamengo won its first league title for 17 years in December and has just elected a progressive female president. 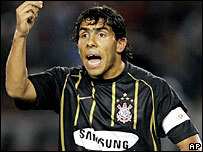 It scored a coup in convincing Zico, its greatest ever player, to return to Brazil and work for the club. But its players continue to disgrace the club’s name. World Cup winner Adriano appeared in photographs with a machine gun and making gang signs alongside a Rio drug trafficker. He consistently missed training, fought publicly with his girlfriend, and was recently sold to Roma. His partner up front Wagner Love was recently hauled before police after he was filmed attending a funk ball in a Rio favela with bazooka wielding drug traffickers providing him security. It’s tempting to see that sort of behaviour as somehow linked to the club’s ties to Brazil’s poor and that favela culture. But more relevant is Flamengo’s tolerance of such acts and the increasing trouble that they and other clubs have in dealing with them. One of the most surprising facts about Brazilian football clubs is that they openly have two sets of rules. There is one code of conduct for the big stars and another for the rest. The stars not only get much higher salaries, they also get more time off and other perks. In most countries it would led to revolt or outright battles but most Brazilian football players are too submissive to complain. The stars can always threaten to leave if their perks are withdrawn. There are spoiled football players at most clubs. They get so much money these days that they consider themselves above the rest of humanity – especially fans. But in condoning such behaviour clubs like Flamengo are sending the wrong message to players who often don’t have the education or savvy to cope with the demands and rules of the real world. 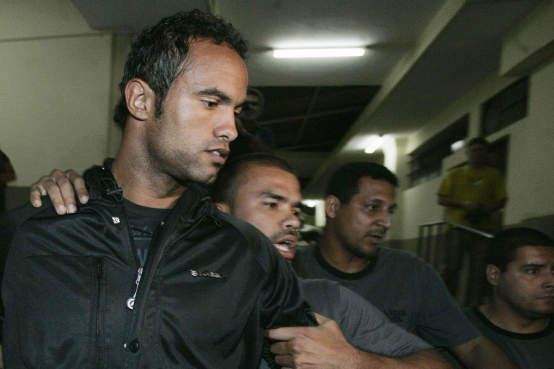 It is not easy for players like Adriano and Love, who grew up in favelas, to avoid knowing the gang figures who control what goes on there. But clubs need to be firmer and let them know what is acceptable behaviour and what isn’t. As long as they don’t, they risk sending players like Bruno the message they can get away with murder. They can’t.